Luxi, I'm sure, could pipe in, too. companies, like Dell, HP, Sun, etc. apart from the smaller companies. problems, since hardware failures usually increase with increased temps. especially in a challenging conduit, like a 1U or 2U server. > orange monsters in the picture). > PCI slots, again, with no contribution to cooling the  CPUS. 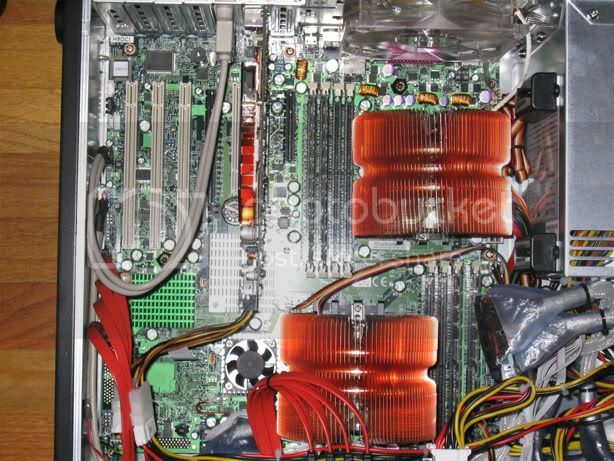 > For comparison, here is a Rio-works  HDAMA motherboard which we have. > all seem to be on ebay and those links could disappear at any time. > the shield that normally goes around the jacks on the motherboard. > The HDAMA machine is pretty darn ugly, but it definitely "breathes"
> it can be purchased easily.